Bi-Flo Inlet has two valves for dual directional air distribution, while Mono-Flo Inlet has one valve for one-way air distribution. Quad Flo has four valves for 4-way directional air delivery. Counter-weighted valve automatically closes when fan slows down. Insulated valve automatically opens as fan speed increases. 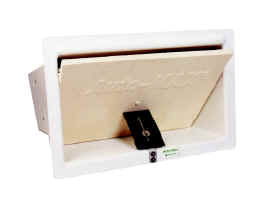 Hinged wall inlet door can be closed during cold winter periods or can be partially closed to direct air flow. Optional fiberglass hood blocks wind. Top Jet TJ 4200 creates less draft and chilling. louvers that open from the TOP instead of bottom. 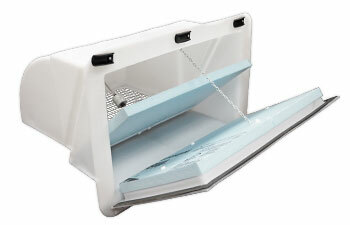 Directs air flow along the ceiling and holds air up longer while mixing with room air evenly. Snap-together design! 11 lbs. each. A frictionless sytrofoam flap on a continuous PVC hinge swings down to access the main room to clean attic air. Fully insulated to minimize condensation, dripping, or freezing. Double L's C2200 Ceiling Air Inlet delivers considerably more cfm than the old C2000. Compare the performance of the C2200 Ceiling Inlet with 2,089 cfm at .125 SP to the old C2000 Inlet with 1,650 cfm at .125 SP. The extra cfm per inlet allows the customer to use fewer inlets per room, resulting in extra savings. 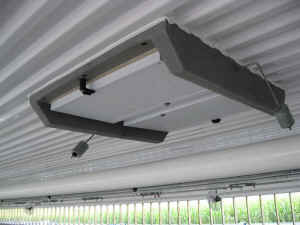 C2200 Ceiling Inlet operates automatically off of negative pressure supplied by exhaust fan. 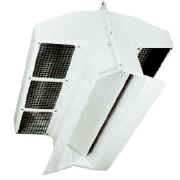 Counterbalance louvers adjust automatically to static pressure. Each inlet can be shut off for better air control. The Fast Frame consists of a plastic outside frame with a wooden inside frame that provides a clean, professional installation with no exposed lumber. 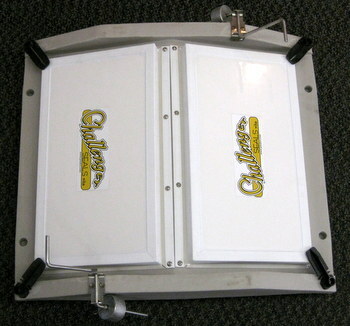 This frame accommodates the C2200, AC3010, GC1140, and TJ4200 inlets. The JWI-1200 and JWI-2400 Inlets open wide when plenty of air is needed, flow adjusts automatically to protect animals during cooler periods. 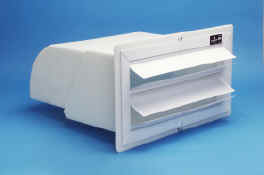 Insulated hinged cover can be closed tight in cold temperatures or adjusted to any degree for proper air distribution. Framed Opening: 14" x 22"
Framed Opening: 14" x 45.5"
Auto-Max Inlets eliminate seasonal readjustment of weights and springs to keep incoming air speed constant. 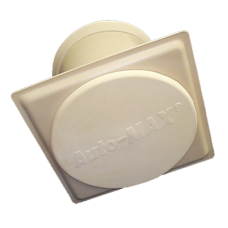 Auto-Max Inlets are pre-calibrated and ready for installation. 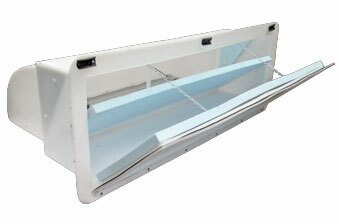 Auto-Max 1000 CFM Wall Inlet constructed of all weather RTM-Glas fiberglass housing. 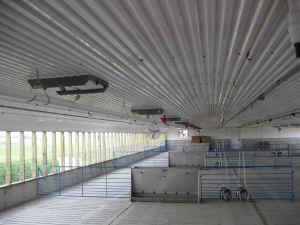 Auto-Max 1000 CFM Ceiling Inlet constructed of corrosion-resistant components. Ceiling Inlets provide unobstructed 360º delivery of fresh air. Auto-MAX inlets always deliver their rated CFM capacity year-around both on still and windy days. 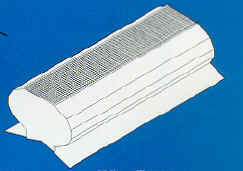 Wind pressure effects on Auto-MAX are almost immeasurable because of the unique Auto-MAX design. University tests, using certified air testing methods, show that other leading air inlets rarely approach their rated capacity, even in still-air conditions and with continuous manual adjustment. With wind pressure or low winter-time static pressure, only Auto-MAX continues to perform totally automatically, according to its rating. Auto-MAX inlets totally eliminate seasonal readjustment of weights or springs. Factory calibration keeps incoming air speed nearly constant in the desired 800-1000 FPM range. This insures maximum ventilation efficiency and draft-free mixing of incoming air. No other inlet achieves this goal. Every Auto-MAX inlet becomes part of a balanced ventilation system. Auto-MAX inlets automatically stay balanced all year long. Every inlet admits the same volume of air for uniform air distribution. No frustrating trial-and-error balancing by “tweeking” counterweights or springs! Constructed of 29 or 26-gauge lock forming quality prepainted white and galvanized steel. Functions as both fresh air inlet and natural ventilation outlet. Constructed of durable RTM-Glas fiberglass to stand up to extreme temperatures and corrosive gases. 4’ Long, 3000 CFM, 40 lbs. Due to Del-air going out of business no new items are available. We still stock Del-air parts in inventory that are still available.